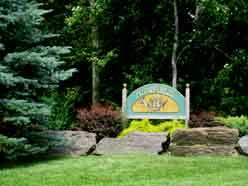 Topsfield Kennel is nestled on 200 acres in the Green Mountains of northern Vermont. Both Dom and Claudia’s involvement in showing various breeds of dogs (and horses) had begun when they were much younger. Dom showed Dobermans and Dalmatians in the 50’s and Claudia showed a St. Bernard and competed in Junior Handling in the 60’s. 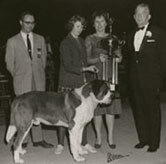 Claudia is pictured right with her St. Bernard, the future Best in Show winner, CH Bowser Waller (Waller is Claudia’s maiden name), winning the First Company Governor’s Foot Guard Jr. Showmanship competition in 1962. 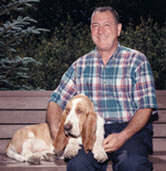 The judge was Basset Hound breeder, Howard Nygood. 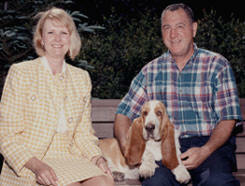 Perhaps it was fate that almost 25 years later she herself fell in love with the Basset Hound breed, with which Howard and his wife Blackie was also involved! It also led them to purchase several pack hounds from the now disbanded Timber Ridge Basset Pack of Maryland, one of which was CH Strathalbyn Beguiling, pictured right with Dom. Claudia and her late husband, Dom, have owned and produced over 125 champions. 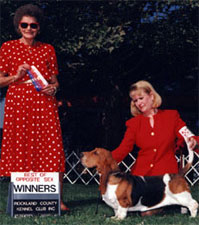 In the last 13 years, Topsfield Basset Hounds have won over 100 All Breed Bests in Show, over 500 Group Firsts and numerous Best in Specialty wins, including three Basset Hound Club of America National Specialty Breed Winners. Claudia's Topsfield Basset Hounds continue their success. 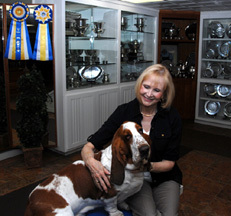 Claudia is currently (2014) chairman of the Basset Hound Club of America Judges'/ Breeders’ Education Committee. She has also served on the BHCA Health and Research Committee. Claudia authored the “Breeder’s Toolbox” column in the BHCA's newsletter, Tally Ho for a number of years. 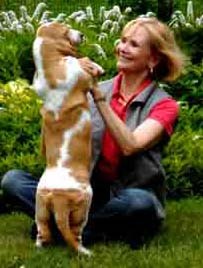 She has spoken at numerous National Specialties and dog clubs and has been a speaker for the AKC/CHF Breeder’s Symposia, the Eukanuba Breeder’s Symposium and various AKC Judge’s Institutes. She has also developed a home study program and seminar for breeders called the ABC’s of Dog Breeding, which is sponsored by the American Kennel Club and the Canine Health Foundation. She has more recently authored the Practical Canine Anatomy & Movement Home Study Program & Seminar for breeders and judges. 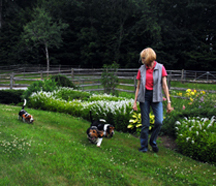 Claudia is still actively involved in her breeding program and showing her Basset Hounds. She judges Basset Hounds, Dachshunds, Petite Basset Griffon Vendeens, Beagles, Basenjis, Rhodesian Ridgebacks and Junior Showmanship. 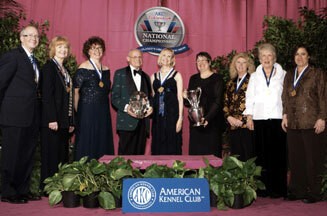 In 2011, Claudia joined AKC's innovative Breeder of Merit Program. 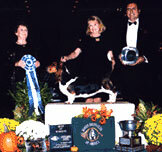 Claudia was a 2009 Dogs in Review Outstanding Breeder nominee. Claudia was honored to be named as the 2009 AKC Breeder of the Year which was awarded during the 2009 AKC Eukanuba Championships. 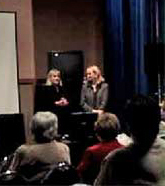 Information on the ABC's of Dog Breeding and Practical Canine Anatomy & Movement can be found at www.abcsofdogbreeding.com. Basset Hound University information can be found at www.bhca-bhu.org.